Sometime in the past year, the Rogue pub in the Pearl vastly expanded the number of taps they have -- to 36, according to the website. Right before they did that, a bartender told me that they would have a lot more guest taps, but that doesn't seem to be the case. Today they had Guinness, Lindeman's, and something forgettable that I forgot. Instead of guest taps, what they offer is an awesome selection of Rogue beers, including several of the "Track Town" ales from their Eugene brewery, and a couple from their brewery in Issaquah, Washington. 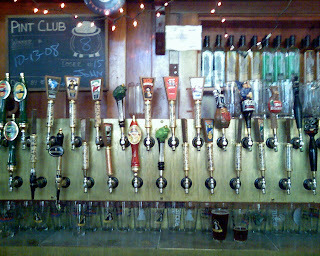 Today they had 4 or 5 of their XS brews on tap -- extra-strong, served in a 10-ounce goblet -- including the Imperial Younger's Special Bitter, the Imperial Red, and a couple of other imperial this and that. It's a nice place to pop in for lunch -- a little bit pricey, but hey, you're in the Pearl district, and the burgers are made with Kobe beef. There's a choice of seating -- some tables outside if weather permits, a non-smoking restaurant area inside, and a bar area without table service. Even though it allows smoking (until January 2009), I usually end up in the bar to be close to my beer. The smoke has never been too bad when I've been there. The small distillery currently produces a decent gin and a couple flavors of rum. If you're there around 2 PM on a weekday, you can take a tour of the distillery, which is pretty interesting and includes a couple tastes. By the way, the pub can sell you a bottle of the homemade spirits, and it's open long after the liquor stores have closed in Oregon. Say it's midnight Saturday and you just realized you have to have a beer martini, but you don't have any gin. Well, hurry on down to the Rogue pub, and buy a bottle of gin -- they'll even sell you the beer. I'm not sure about the olives. My main reason for hitting Rogue today was to try the Independence Fresh Hop Ale, made with hops from Rogue's own farm. Independence was a solid beer, not in the top fresh-hop ranks, but I was quite happy with it at lunch. Speaking of happy, that's how I felt about catching the tail end of a Rogue "garage sale" at the pub: I walked out with a growler of American Amber for $6 (six-pack equivalent price of $6.75, or if you deduct the $2 price of an empty growler, it's like a $4.50 six-pack). I love the Rouge Brewery in the Pearl, I even celebrated my birthday there last month, but you know what annoys me? Their burgers are made with "American Kobe" beef. Any foodie worth her Hawaiian sea salt knows that Kobe beef is only from Japan. American Kobe-style beef is Wagyu. Mary Sue: Don't you think it's a little odd to use fancy beef like that in things like meatballs and well-done hamburgers? Though I've even seen Kobe pot-roast somewhere before. I eat only the finest Japanese Kobe beef tripe and tail. The Wagyu is far too tough for my delicate palate.